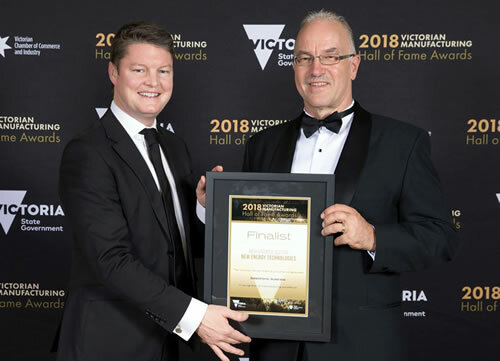 Selectronic were announced as a second place finalist in the New Energy Technologies category in the 2018 Victorian Manufacturing Hall of Fame Awards. The event took place at the Crown Palladium in the heart of Melbourne CBD on Monday 28th May. Many applicants were received for New Energy Technologies one of six high growth sector categories that make up the annual event. The awards recognise exemplary companies and individuals in the manufacturing industry in the state of Victoria. Selectronic is a family-owned Australian business for more than 50 years, and a leading manufacturer of multi-mode solar inverter products. Its flagship model, the SP PRO is made at the Selectronic production facility in Chirnside Park, using over 83% of Australian made parts. Selectronic CEO Rod Scott, was presented with the finalist award by Ben Carroll, Minister for Industry & Employment. “Receiving this award is a fantastic achievement for Selectronic, it symbolises the daily efforts of our hard working team. These awards celebrate Australian manufacturing and demonstrate that Australia has the opportunity to be a key player locally and to the world in new energy technologies and more specifically, the energy storage market. The state’s manufacturing industry contributes $27.7 billion to the Victorian economy, with more than 13,000 businesses employing more than 286,000 people. 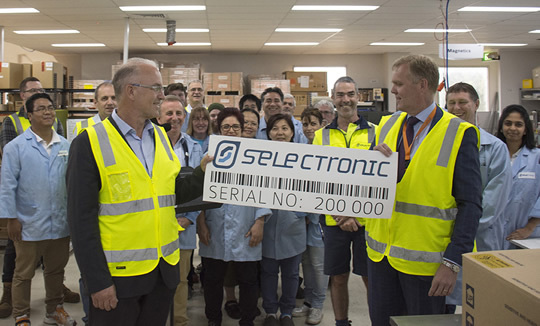 Selectronic celebrated a milestone event in achieving serial number 200,000 of its product range, at an event held on Tuesday 20th March at its production facility in Chirnside Park, Victoria. The event was commemorated with special guest the Hon Tony Smith MP, Federal Member for Casey Victoria and Speaker of the House of Representatives. 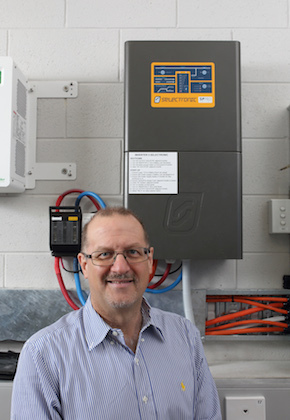 A family-owned Australian business for more than 50 years, Selectronic is a leading manufacturer of multi-mode solar inverter products which now operates under the guidance of brothers Rod and Ken Scott. 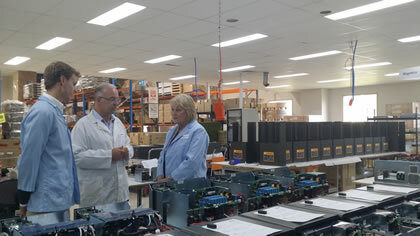 Rod Scott, CEO for Selectronic, guided Tony Smith on a tour of the Selectronic facility, meeting the Selectronic team and learning how the flagship range of SP PRO solar inverter products are made, before helping to load and seal the 200,000th serial numbered product. Other visiting guests included key representatives from the Smart Energy Council and Clean Energy Council, of which Selectronic is a founding member. 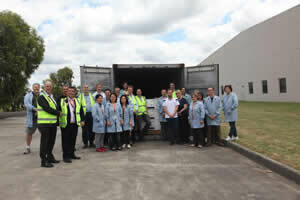 “We are delighted to celebrate this significant milestone for Selectronic with Tony Smith. As a team, we pride ourselves on the fact that Selectronic products are designed and made in Australia, something that has not changed for over 50 years. “It’s great to see Selectronic, a family owned business based in Chirnside Park, successfully operating after five decades of continuous manufacturing. Rod and his team’s ingenuity and adaptability in developing Selectronic into a leading manufacturer of transformers and inductors are inspiring. To have produced your 200,000th multi-mode inverter unit is a testament to your success as a company. Expanding the flexibility of our products, the SP PRO battery inverter can now be used with the following Lithium batteries. All of the above are officially approved for both Off Grid and On Grid systems, however you must refer to the battery manufacturer for specific details and installation requirements. These battery additions will provide integrators with more options for designing quality storage systems. All you will need is the appropriate 48V SP PRO and the matching Battery Communications kit. Battery Communications kit include the updated Communications Card 2017 and the correct communications cable for the fastest and easiest installation possible. New CEC Battery Installation Guidelines for Accredited Installers become mandatory on November 1st 2017. The current myGrid box does not comply with all of the requirements of the new guidelines. Therefore all myGrid products will be discontinued from November 1st. 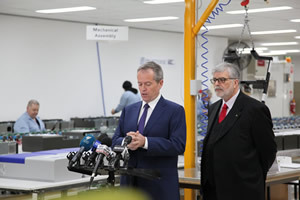 Today Bill Shorten, Federal Leader of the Opposition, and Kim Carr, Shadow Minister for Innovation, Industry, Science and Research visited Selectronic Australia in Chirnside Park, Melbourne. 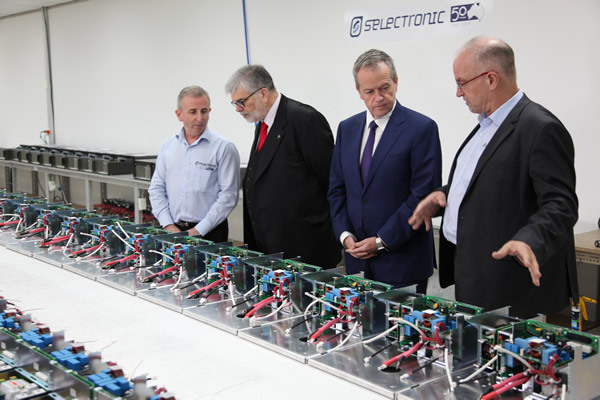 The Labor politicians visited Selectronic to show their support of Australian manufacturing in the renewable energy sector. Their visit coincided with the release of the Finkel report which is an independent review into Australia’s national electricity market. 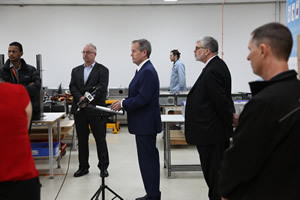 Mr Shorten and Mr Carr seemed genuinely impressed with our operation and how the SP PRO is contributing to energy security for many Australians. A transcript of the media release can be found at billshorten.com.au. Any SP PRO Series II can have a new 2017 Comms Card added to work with single phase LG Chem RESU batteries. These cards are now available. The LG Chem RESU/Selectronic pairing will provide customers with a quality solution to not only reduce their electricity spend, but will also provide a steady flow of power during grid outages. The integration of LG Chem’s RESU series with Selectronic’s world-class inverter has gone through significant testing by both companies to ensure the best solution. There are more than 30 field test sites around Australia enjoying the benefits of this rock-solid combination. “Over the years, we’ve seen a lot of lithium solutions come and go,” said Rod Scott, CEO at Selectronic. “We’ve been in the industry for a long time, and are careful to put out the right solutions and partner with the right companies. 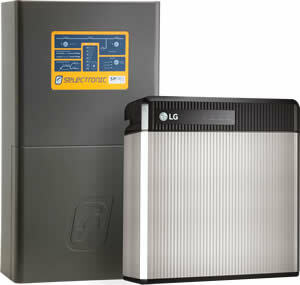 Working with LG Chem was a good opportunity and a great fit for Selectronic”. Important: The 2017 Comms Card must be added to the SP PRO in order for this integration to operate. The 2017 Comms Card should be ordered from your usual place of purchase. For full details on adding the 2017 Comms Card, access the installation note IN0047 from here. You may have been faced with the cost and difficulty of running cables underground, especially on system upgrades using Selectronic's Managed AC Coupling. 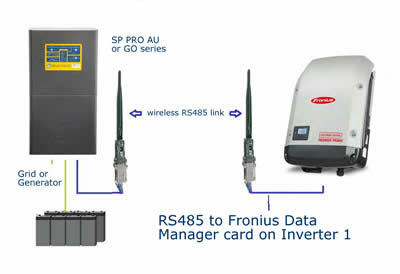 We can now solve that problem with RS485 wireless communications between any SP PRO and the first Selectronic Certified Fronius Inverter. For full details, access the installation note IN0048 from here. 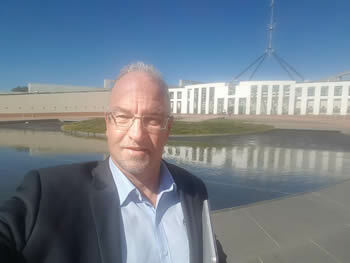 Today our CEO Rod Scott, attended a special Parliamentary briefing on Energy Storage in Canberra. We are proud that was there to bring attention to our home-grown solutions. All Federal MPs and Senators, across all political parties, were briefed on residential, commercial, utility-scale, on-grid, off-grid and micro-grid energy storage. Congratulations to Lindsay Hart and Ken Scott for well and truly being qualified to attend the Solar Pioneers celebrations in Sydney on Friday night, 17 March. These Selectronic legends contributed 70 of the 2129 years of experience gathered in the room. Special mention to Lindsay, who with Kathleen Ryan of Winaico and Nigel Morris of Solar Analytics, was one of the organisers of the hugely successful gathering. 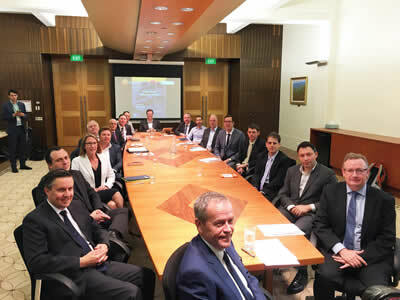 Selectronic’s CEO, Rod Scott, joined Bill Shorten, Leader of the Opposition, and Mark Butler, the federal Shadow Minister for the Environment and Energy, at the Energy Storage Council roundtable summit yesterday. They discussed opportunities for energy storage for residential & commercial applications for on-grid, off-grid and micro-grid scenarios – something that we have been doing for more than 35 years! We're pleased to announce that SimpliPhi Power has endorsed the use of the SP PRO with SimpliPhi's line of Lithium Ferrous Phosphate (LFP) energy storage products. This installation by Greenwood Solutions just went live in Melbourne's eastern suburbs. A letter from SimpliPhi Power's Vice President of Sales states, "Based on our extensive review of documentation provided by Selectronic, combined with customer feedback from the field, we find that our products are compatible and can be safely integrated by properly trained professionals following manufacturers' specifications". The Victorian Government has awarded Selectronic Australia $250,000 in grant funding as part of the New Energy Jobs Fund. These funds will make an important contribution to a project to make renewable energy storage systems more efficient and cost effective. Selectronic will be working with other project partners including Relectrify to use shared communications protocols to enable plug-and-play between intelligent inverters, batteries and weather forecasting apps. This project is the first in Australia to use SunSpec communication protocols to enable compatibility between locally made components – inverters and batteries – as well as integrating third party software, such as weather forecasting apps, into the system. Amidst the flood of new batteries hitting the Australian market, Relectrify battery systems take the unique approach of re-using capable battery cells. In Victoria more than 14% of households have local solar generation and there are more than 1.5 million small-scale PV solar systems installed across the country. The sticking point is that the cost of energy storage still remains high with long pay-back times; this project aims to reduce that payback time and give people more control over their power choices. Selectronic has expanded its offering of Selectronic Certified grid-tie inverters to include five models of the Fronius Primo range. A Selectronic Certified grid-tie inverter is the first step in building a solar power system with maximum efficiency and ultimate flexibility. Selectronic Certified inverters have additional communications to enable the SP PRO multi-mode inverter to manage the PV output resulting in perfect control of the solar power system - this is known as Managed AC Coupling connectivity and was pioneered by Selectronic in 2010. A Selectronic Certified grid-tie inverter may be used in all types of solar power systems; grid-connect with or without batteries or fully off-grid. It is a cost-effective, future-ready solution for those who want solar but are not yet ready to add battery storage to their system. Batteries and an SP PRO can be added later with seamless integration. 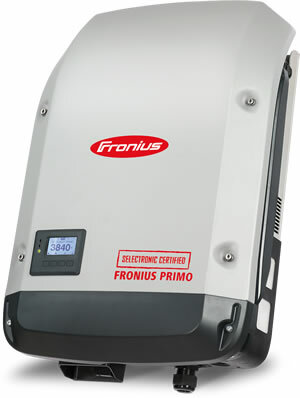 The Selectronic Certified Fronius Primos are available in power ratings from 3.0 to 8.2 kW. Fronius is the latest inverter to join the Selectronic Certified range which already includes the ABB PVI grid-tie inverters. Whether a Solar Hybrid system or fully off-grid, a Selectronic Certified Fronius inverter will integrate seamlessly with an SP PRO to give you the ultimate solar power system. Iresha Klinbail, the mother of a 12 week old baby, generously offered the use of her fridge and freezer to local mothers to store their expressed breast milk and food during the past two days’ power outages. Iresha and her husband installed a Solar + Storage system on their home in Selby last year to enable them to utilize more of their solar generated energy. The system has the added benefit of being able to power their home from the energy stored in the battery bank when the electricity grid goes down. Their home storage system features a locally manufactured battery inverter, the SP PRO, made by Selectronic Australia just down the road in Chirnside Park. Iresha is a member of a local Facebook group for mothers located in and around the Dandenongs. The group offers support, advice and acts as a social hub for mums in the hills and surrounding suburbs. As soon as the power went down, members started posting and sharing information about the outages. Iresha realised she was in a unique position by still having power. “We figured we had the ability to help so it didn't make sense to not offer. We've got a 12 week old and I'd be devastated if I lost expressed milk.” At least one local mum took up her offer and Iresha was able to pick up the milk and store it for her. Says Rod Scott, CEO of Selectronic, "“We’re thrilled that our SP PRO was able to keep everything on at Iresha’s home over the past few days and are impressed with her community-minded spirit. Luckily we didn’t lose power at my home in Ferntree Gully this time, but there have been many occasions over the years when we’ve been the only home with lights on in our street. It’s also great to see local families supporting local manufacturers. There are hundreds of SP PROs installed throughout Melbourne and we know that at least they weren’t amongst the 22,000 without power over the past couple of days." 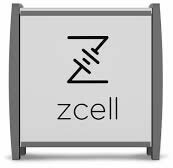 Australian battery company Redflow Ltd today announced that its new ZCell battery is compatible with the SP PRO battery inverter from Melbourne-based electronics manufacturer Selectronic Australia. Thank you to all those who visited us at Solar Energy 2016 at the Melbourne Convention and Exhibition Centre last week. Over 4500 people attended the show and it felt like most of those visited our stand at some point over the two days! We scanned a record number of attendees onto our stand and will contact those delegates via email in the next week or so. It was heartening to hear those who have used our products extolling the virtues of the SP PRO and we also appreciated the opportunity to introduce our range of smart bi-directional inverters to a new audience. The Sales and Marketing department, consisting of Lindsay Hart, Craig Hunter, Stephanie Paterson and Amanda Lenihan were kept so busy chatting to people that we really appreciated some of the guys from Krannich and MPower helping us our on our stand each day. Rod Scott, our Sales and Marketing Director, spoke across all three conference streams and was able to share his experiences of the booming interest in solar plus storage to hundreds of interested delegates. Thank you to all those people who entered the SP PRO Star and Wish competition. We are collating the feedback on the star feature of the SP PRO and the feature that people wish our inverter-charger possessed. Congratulations to Warren from New World Solar Solutions & Ben from Phase Electrical & Energy Solutions who won $200 Red Balloon vouchers - the flexibility of their prize matches the flexibility of our SP PRO! If we missed you at Solar Energy 2016, hopefully you can catch us at All Energy in October. How do you make a great product even better? From 1 April 2016 we extended our warranty on the SP PRO series and improved our prices - and that's no joke! It's now possible to receive up to 10 years warranty on an SP PRO series in Australia & New Zealand and up to 5 years in other countries - all this is backed by a company that's been around for more than 50 years. Click here for the warranty registration page. On top of all this, we have made new commitments to pricing. Contact your Selectronic Distributor today for an updated price list. Relax, Selectronic really does have you covered. From 1 June 2016, Selectronic will no longer be the service agent for KACO grid tie inverters in Australia and New Zealand. From this date, KACO Asia will take responsibility for the service and repair of their products in the Asia-Pacific region. KACO Asia is in the process of implementing their new service protocols for Australia. We will continue to support our customers and assist in any way we can to reduce the impact of the transition to KACO Asia, and post further updates once arrangements are finalised. Selectronic have a long association with KACO, beginning with the distribution of the KACO Powador in 2008. In 2013 KACO recognized our SP PRO bi-directional inverter as being one of the most advanced in the world and began to distribute it in Europe under the brand name, the 'blueplanet gridsave eco'. Another container of our Australian designed and manufactured inverters left for Germany late last year. Despite the cessation of our service agreement in Australia, Selectronic expects the export of the 'blueplanet gridsave eco' to continue to prosper. If you need any further clarification on this matter, please contact us. Selectronic Australia – Germany needs us! 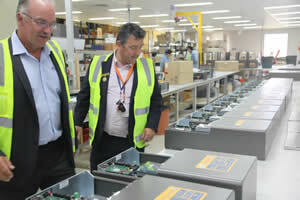 Yesterday, the new Mayor of Knox, Cr Tony Holland visited Selectronic Australia’s premises in Chirnside Park to witness a container of 95 of our Australian-designed and manufactured inverters leaving for Germany. 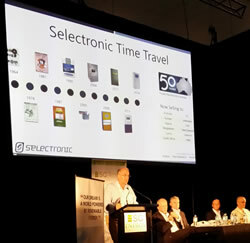 Selectronic is a company that has been manufacturing for more than 50 years with humble beginnings in Boronia in 1964. The company has been designing and manufacturing inverters since 1981. These inverters allow you to manage and store excess energy generated from a renewable source such as solar panels. The Germans invented this technology – Selectronic perfected it. Selectronic exports to countries all over the globe including Germany which is generally regarded as manufacturing the best solar equipment. The German company, KACO, recognises the superiority of these inverters and distributes them in Europe under their own brand name. “We are looking to build our export market over the next 12 months – one container per month equals 100 new permanent full-time Australian jobs. These new jobs would be both at our head-quarters here along with new jobs at our Australian suppliers. New jobs would include production, engineering as well as research and development” says Rod Scott, Selectronic’s Director of Sales and Marketing. Selectronic is extremely proud that it manufactures its products right here in Melbourne. 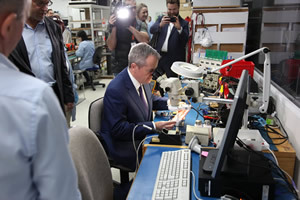 The company employs approximately 35 people here in Chirnside Park. 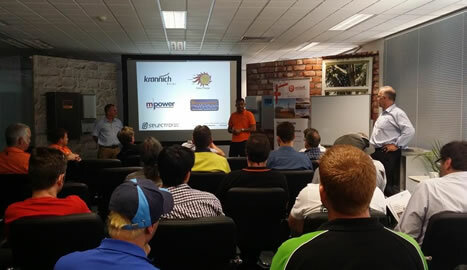 This morning energy storage manufacturer, Ecoult, hosted a room full of solar installers at Selectronic’s headquarters in Chirnside Park, Melbourne. Ecoult were here to promote their Ultraflex 48V Plug ‘n’ Play Energy Storage Range. The Ultraflex system is designed to use their high-cycling, energy-efficient UltraBatteries in commercial and residential applications, providing more than 11kWh usable storage and 25kW of peak power. 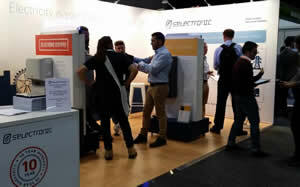 Selectronic's training room was the ideal choice for the Melbourne leg of the roadshow. 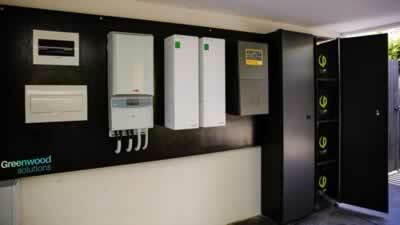 Selectronic's inverters and Ecoult’s batteries are already working together in many installations throughout Australia. Selectronic is proud that our SP PRO bi-directional inverter charger is ‘battery agnostic’; it has a highly configurable set of battery charging parameters using our SP LINK software. Here you can adjust the voltage, maximum current and the time of each of the five possible charging stages. This means that almost any battery technology can be used with a SP PRO. Ecoult recognises that the SP PRO is one of the most sophisticated, reliable and trusted inverters on the market and chose to partner their batteries with our inverters in installations as varied as remote off-grid telecom sites and grid-connected commercial premises. Still reading our news items? We're glad you've enjoyed reading our updates so far! Some of our historical news items can be found here.